Alberobello (Bari Jarubbèdde dialect) is an Italian town of 11,000 inhabitants in the province of Bari, in Puglia, in the center of the Itria Valley and the Land of the Trulli. The origin of the name has been the subject of studies and recent contributions   that "The original name of the Selva was" Silva Alborelli ", as follows from oldest authentic document to the attention of scholars, namely the Diploma investiture of May 15, 1481 the King Ferrante of Aragon, by which the goods of the deceased Count Giuliantonio I, the hero of Otranto, were assigned to his son Andrea Matteo illiterate. In this document, derived from the Great Archive of Naples, Reg . Privil. FoI. 32 and 59, VoI. 39, and reported in the text, p. 319 of the remarkable history of Conversano, reads literally, "Silva Alborelli in Bari province our Earth." Famous for its typical houses called trulli that, since 1996, are UNESCO World Heritage Site , is part of the Itria Valley. history of these buildings is very special due to an edict of the Kingdom of Naples in the fifteenth century underwent a tribute each new urban settlement. Accounts of Conversano, owners of the land on which it stands today Alberobello, imposed then sent to the farmers in these dry lands to build without the use of mortar, their homes, so that they could be seen as precarious buildings, easy demolition. Having therefore use only stones, farmers found themselves in a round shape with a self-supporting dome roof, made of stone circles overlapped, the simplest configuration and solid. domed roofs of the trulli are embellished with decorative pinnacles, whose shape is inspired by symbolic, mystical and religious. maestranza They were made by hired to build the trullo and identified the craftsman. Depending on the quality of the pinnacle of the bill could therefore identify not only the skill of the craft manufacturer, but the value of the building. Increased spending in the construction of the trullo allowed to identify therefore the more affluent families from the less wealthy. 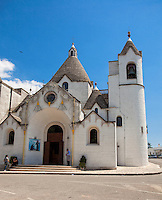 Regarding the symbols painted on the roofs of the trulli often take on a religious meaning can sometimes be signs of the zodiac ., Pinnacle and symbol painted together formed a sort of civic identity, as seen for a long time Alberobello has denied official recognition by the Counts of Conversano.